According to credible media outlets and baseball experts, the Chicago Cubs are favored to win it all in 2016. In 2015, the team, made up of young superstars such as 24-year-old Kris Bryant, 26-year-old Anthony Rizzo, and 29-year-old Jake Arrieta, was able to muscle out 97 wins in the regular season. Although the club finished 32 games over .500, they finished the season in third place in the incredibly competitive NL Central. Managing to clinch the 2nd Wild Card spot, the club rolled through the first two rounds of the playoffs before having their dream season cut short by the New York Mets in the NLCS, who swept the Cubbies in four games to advance to the World Series. Although Cubs GM Jed Hoyer and President of Baseball Operation Theo Epstein could have remained quiet this offseason, they decided to take one of the best rosters in the Majors and improve upon it. The organization added 3x Gold Glove winner Jason Heyward, 2x All-Star utility player Ben Zobrist, and 165 – 127 career starter John Lackey. The result? A team who on paper, will be unstoppable in 2016. While variables such as injuries and slumps are always unknown, fans aren’t shying away from digging deep into their pockets to see the team play towards a World Series title in 2016, a feat the organization hasn’t accomplished in 109 years. According to our data, ticket prices for the Chicago Cubs are up almost 30% compared to the same period last year. In 2016, the average price for a ticket to attend a Chicago Cubs home game is $124, which trails only the Texas Rangers ($132) in average home game ticket price, and is $63 higher than the team with the lowest average home game price, the Los Angeles Angels of Anaheim ($61). The increase in ticket prices is most likely a direct correlation of ticket demand, which to no surprise seems to depend on the team’s performance. In recent years, there has been a steady increase in average attendance at Wrigley Field as the team finishes with a better record each season. According to ESPN, in 2013, the average attendance for a game at the historic stadium was 32,625. The Cubs finished that season with a record of 66 – 96. In 2014, the average attendance increased slightly, with the team finishing with a better record of 73 – 89. However, with a 97 – 65 finish (0.599 winner percentage) in 2015, the average attendance jumped to 36,540, an increase of almost 4,000 people per game. With the addition of talent in 2016, the team is expected to finish the season with an even better record, which would indicate the average attendance per game will be even higher this season. Although time will tell if the Cubs can live up to their expectations in 2016, fans are making sure they’re at Wrigley in person to cheer on the team as they try to go all the way this MLB season. If you’re interested in seeing the Cubs this season, make sure to partake in our “Home Team Advantage” promotion. If the Cubbies (or the home team listed on any MLB tickets you purchase on TicketNetwork.com through April 30) win the 2016 World Series, we will refund you for the full cost of your tickets! Click here for more info! The 2015-16 Golden State Warriors are arguably the best team to take the court since the 1995-96 Chicago Bulls, who ended the season with 72 wins, an NBA record. In 2016, Golden State has the chance to finish the NBA season with at least 73 wins, which has basketball fans across the country shelling out hundreds of dollars to witness the team as they attempt to set the new win record. According to data from the TicketNetwork Exchange, the average ticket price for the remainder of the Warriors’ home games is $450. The NBA average for home game tickets is $159, which comes out to an 183% increase in price for Warriors home game tickets versus the league average. On the other end of the spectrum, the Philadelphia 76ers, who hold the league’s worst record, have the lowest average price for home game tickets at $65, which is $385 less than the average for Golden State tickets. The average ticket price for Warrior’s away game tickets isn’t much cheaper. At $437, the average price for Golden State away tickets is $278 higher than the NBA average for away games, which is $159. The Milwaukee Bucks, who are in 11th place in the Eastern Conference have the lowest average price for away game tickets at $86. The earliest the Warriors can top the Bulls’ 1996 record is on April 7. In order for that to happen, the team needs to win each of their matchups leading up to, and including their game against the Spurs that night to reach 73 wins. On January 1st the average price for tickets to that night’s game was $395. Fast forward to March, and the average ticket price for the same game has risen to almost $600, as the chances of the feat occurring on that day at Oracle Arena are looking more and more probable. If the Warriors can’t reach the 73 win mark on the 7th, then they will have three more chances to do so, with the final opportunity occurring on April 13th, the team’s last scheduled regular season game. Like the average ticket price for April 7th’s game, the same trend is true for the Warrior’s home game on the 13th against the Memphis Grizzlies. On the first of the year, the average price for a ticket for that game was $364, however, in March, that price has risen to $467. Golden State has 15 games left this season, 9 of which are at home, where they remain undefeated this season. This puts the team in a great position to win at least 73 games. While time will ultimately tell, the prices fans are paying for tickets suggest that most people believe they will break the all-time win record in 2016. Average resale price for Brooklyn Nets tickets drops 34% since the 2012-13 season. When the New Jersey Nets moved to the brand new Barclays Center in Brooklyn, NY for the start of the 2012-13 season, the franchise had high hopes and expectations. With a roster featuring the likes of Deron Williams, Joe Johnson, Gerald Wallace and Brook Lopez, the team looked poised for contention. 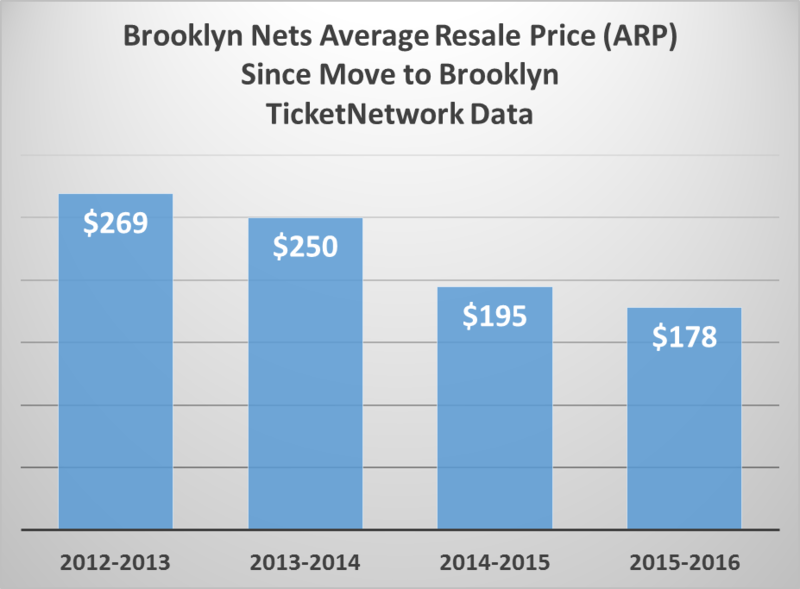 Those expectations, along with the excitement of a new team in Brooklyn resulted in an average resale price (ARP) of $269 per ticket during the 2012-13 NBA season, according to Ticket Network. * These numbers were competitive with the top selling NBA teams like the Los Angeles Lakers and cross town rivals, New York Knicks. After being eliminated in the first round of the 2013 playoffs, the Nets looked to bring in veteran talent for the upcoming season. The Nets traded Gerald Wallace, Kris Humphries, and draft picks for the Celtic’s Kevin Garnett, Paul Pierce, and Jason Terry in a blockbuster trade. For more ammo, newly retired All-NBA PG Jason Kidd was hired as the Head Coach. At this point, the Nets pre-season tickets still commanded a high ARP. The demand continued into the regular season and remained strong from start to finish for a healthy ARP of $250. How did the Brooklyn Nets fall off in such a short period? After making it to the Conference Semifinals the previous year, the Nets were unable to retain Jason Kidd for the 2014-15 season. Player animosity and miscommunication from ownership led to a rocky franchise, upsetting fans in the process. Supporters began to take notice of the discombobulated team and by the end of the 2014-15 season the ARP dropped a staggering 27% to $195 per ticket. The Nets failed to win a championship after employing a “win-now” strategy and the team was left with an aging roster and big holes to fill. After another disappointing season, the buzz and excitement seemed to be a distant memory. In only a few short years a much different picture is being painted. For the fourth consecutive season, the average resale price for the Brooklyn Nets dropped. The $178 ARP for the 2015-16 season is a 34% decrease since the 2012-13 season, one of the largest drop offs of any team during the same time span. We also saw record low attendance numbers for the Barclays Center and fan interest is now comparable to when the team was still in New Jersey. The Nets will have nearly $40 million in cap space heading into next season after buying out Deron Williams’ contract and finally ridding Joe Johnson’s $25 million salary. They have the money and right city to attract a high-profile free agent like Kevin Durant, Brandon Jennings or Mike Conley. Hopefully the front office can get the job done and turn the franchise around. *Ticket sales data as of 3/10/2016 9:00 a.m. EDT. Trademarked terms are the property of their respective owners and are used strictly for descriptive purposes. TicketNetwork.com is an online ticket marketplace and is in no way associated with the trademark owners or artists mentioned. It seems like just yesterday that Garth Brooks gave us possibly the oddest press conference of all time. Part stream of consciousness where he declared his love for all of his fans, part not-much-real-information about upcoming plans, Brooks declared that he was back! Having entered semi-retirement to raise his children (a worthy excuse!) in 2000, Brooks had only appeared a few times in the intervening years, mostly for benefit concerts, but also once in 2008 for a string of concerts in Kansas City, MO. Brooks also took up weekend residency shows in a stretch at the Wynn Las Vegas that lasted from 2009 to 2014. An initial look shows us that the Rosemont, IL, set of shows sold the best here at TN.com, with 10% of all ticket sales for the tour, compared to 6% for runner-up Atlanta. However, it is difficult to compare sales between cities since Brooks had a different number of shows per city. For example, Rosemont had eleven shows while Atlanta had seven, which usually means that a city with higher number of shows will have more tickets sold, just because more seats are available per city. There are some exceptions to this rule. Minneapolis saw fewer sales than Atlanta, despite the former having more shows. What is a little easier to compare is the day of week that has done the best throughout the tour, and to what I’m sure is nobody’s surprise Saturday is that day. Over 48% of tickets sold on TicketNetwork.com for the Garth Brooks tour have been for Saturday shows. This makes a lot of sense as relatively few people work on Saturday, but the difference between it and other days is huge. For example, Friday shows only account for 28% of tickets sold, and Sunday 12%. It quickly goes down from there, with Monday shows accounting for below 1%. At 18 months, and with no sign of stopping, the Garth Brooks World Tour (which has, ironically, so far only been in North America) is well on its way to breaking records. Depending on how you want to define “tour” – whether a tour can effectively never end until the artist/band retires or dies, like with Bob Dylan and The Ramones, or whether it should have a defined end of some sort – Brooks may be on course to break his own record, the 354 shows he played during his previous tour from 1996 – 1998. To date, Brooks has played 215 shows. It’s quite possible that Brooks will be able to beat his own record. Unlike many tours, Brooks’ shows happen in groupings – one city at a time, and usually with some rest in between. The constant travelling back and forth for long periods of time is hard to do. The way Brooks does his tour limits travel and the fatigue associated with it. Cher carried out a 325 show extravaganza during her “retirement tour” from 2002 – 2005, but that’s just not typical and she hasn’t repeated a tour of quite that extent just yet since returning from retirement. And that’s just 18 months. Think about what can happen in two years, or three years? Will we someday be comparing Garth’s tour to things that happen in four years? Maybe. We’ll just have to see. Interested in catching a Garth Brooks concert? Then find tickets to an upcoming show! *Ticket sales data is as of 3/7/2016 10:30 a.m. EST. Trademarked names are the property of their respective owners. TicketNetwork does not claim any right or ownership to any trademark contained in this article. These names are strictly used for descriptive purposes and do not imply an endorsement or partnership. Today, storied quarterback Peyton Manning announced his retirement from the sport of football. In honor of his famed 18-year career, we decided to take a look at secondary ticket market pricing trends for the 14x Pro Bowlers’ most important games towards the end of his career. Starting with his final game against his brother, Eli, in 2013 we’ll look at seven matchups, including his final game, Super Bowl 50. Throughout his career, Peyton Manning faced-off against his younger brother Eli three times, with the final match occurring on September 15, 2013, when Peyton visited the Giants’ home turf, MetLife Stadium in East Rutherford, NJ. With tickets for the matchup in high demand because everyone wanted to witness the high profile sibling rivalry, the average resale price (ARP) for two tickets to the game was $812. Later that season, Peyton Manning hit the field with the Broncos for Super Bowl XLVIII, where they took on the Seattle Seahawks. Taking place at MetLife Stadium once again, the ARP for the game for two tickets was $5,639. Although Peyton was victorious against his younger brother earlier in the season, the Broncos were crushed by Seattle, 43 – 8. The following season, Peyton visited Tom Brady and the Patriots at Gillette Stadium for the final time of his career. Although this was just a regular season game, the ARP for the matchup was a staggering $1,044 for two seats. The Broncos were routed 21 – 43, but luckily for Peyton, that wouldn’t be his last matchup against New England. This past season, Peyton Manning visited the Indianapolis Colts one final time. Fans from all over the area wanted to see him compete against the team that he played for during the majority of his NFL career. Due to high demand, ARP for two tickets to the game was $665. While it wasn’t confirmed at the time, many speculated that the Broncos’ home game against the San Diego Chargers on January 3, 2016, would be Peyton Manning’s final regular season game. Because of that, the ARP for two seats was $634. Although pricy, the game was the most affordable out of the seven on our list. In 2016, Peyton Manning received one last chance to pull off a W against Tom Brady, and this time, the stakes were much higher: the winner would move on to Super Bowl 50. Played at Sports Authority Field at Mile High in Denver, the Broncos were able to pull off a closely contested victory, with a 20 – 18 win. Although not as expensive as attending the Super Bowl, the ARP for two tickets to the 2015 AFC Championship game was $1,289. As it would turn out, Super Bowl 50 against Cam Newton and the Carolina Panthers would be Peyton’s last time playing football as an NFL quarterback. With a 24-10 win over Carolina, Manning finally earned his second Super Bowl ring. For those who made the trip to Levi’s Stadium in Santa Clara, they, by far, shelled out the most to see the future hall of famer play, with an ARP of $9,793 for two tickets to the game. During his time in the NFL, Peyton Manning accomplished what so few are able to during their professional career. Along with being a 2x Super Bowl champion, he was an AFC champion 4 times, and named the AP NFL MVP 5 times throughout his career. While the football community is sad to see him go, he will be remembered as an exceptional athlete, both on and off the field.